Mademoiselle Carven defined her fragrant prototype as "an outdoor perfume that needs to give up its heady character", resembling her, hence the name and the packaging: "white for innocence, youth, and freshness; green because to me it's the most beautiful colour in the world". The creation was none other than Ma Griffe (my signature), the legendary 1946 masterpiece of -by then- already anosmic Jean Carles, for which a startlingly different advertising campaign was devised: parachuting Trocadero in Paris with thousands of sample bottles! What a wonderful idea! But Carven wasn't born so. Petite to extremis, Mademoiselle Carmen de Tomaso founded a fashion house at ni6, Rond Point des Champs Elysées to cater to dainty women's needs like her own, among them Michelle Morgan and Edith Piaf. She decided very early on that her Spanish-sounding name was not on a par in the Paris scene; so she went through the whole alphabet substituting consonants till she stumbled upon V. Carven it would be, alors! From then on she produced frocks as well as frags, from Vert et Blanc and the iconic men's Vétiver to the trio of Robe d'un Jour, Robe d'un Soir and Robe d'un Rêve (a dress for day, a dress for evening and a dress for a dream). Ma Griffe is referenced in Janet Fitch's novel White Oleander , a story about dysfunctional foster care, as the signature scent of Olivia Johnstone, a stylish and agreeable prostitute next door who befriends the young narrator Astrid and later gives her a bottle of Penhaligon's, a metaphor for their relationship. Fitch had an aunt who was an actress, spoke French and traveled to Paris, so when "a really chic French perfume" was needed, Ma Griffe came to mind. True to form, Ma Griffe is a very Parisian idea of a springtime and summer fragrance, très élegant, its cooling freshness contrasting with warmth underneath, powdery as nothing else can be and starkly green. The gardenia note is constructed on styralyll acetate, same as in Miss Dior one year later on a formula by Jean Carles perfectioned by Paul Vacher. Generally floral chypres of the times relied on the heady greenness of this synthesized aroma for their kick of feminine guiles, before progressing to jasmolactone and the tiglates of today. Like I had written when composing the Chypre Series, Ma Griffe was conceived to be "very powdery dry and quite spicy thanks to the weird note of styrax, [...and] managed to be assertive in its name (it means "my signature", but also "my talon") and supremely sparkly and feminine in its aroma. It marked the introduction of chypres into the arena of professional women. Those were not factory workers of the war or flappers; they were secretaries at the new firms; twin set in place, string of pearls and a slick of lipstick on impeccably powdered faces. The psychology of those new chypres talked about women who earned their living by themselves, but did not manifest themselves as sexual predators: There is a sense of detachment and intelligence". Sadly, Ma Griffe has changed its colours like a cornered chameleon over the years, due to change of ownership of the brand, resulting in the occasional cheapening of the formula, opposing opinions and confusion when trying to locate a bottle that prompts the djin to come out. The formula has indeed been reworked multiple times since its birth, ending with the latest version of 2006 eau de parfum being a one-dimensional soapy floral. Current owndership of Arco International is reportedly trying to reposition it. Let's hope so! Maria, also known as Bittergrace to her accomplishes in pagan reversion, critters' photography, political wit and artistic smuttiness, had been most kind in sending me a round of vintage versions for me to compare and contrast with my own and the memories of the women in my family who have worn Ma Griffe faithfully. The oldest, coming from the 70s in a splash bottle smells intensely citrusy, with an aldehydic fizz that makes a sparkling overture to the floral green proceedings. Since bergamot was one of the first photo sensitizers to be heavily restricted, I assume the second batch in a clear swirl-capped bottle, which comes from the 80s, has lost its shining citrus tang due to that. In addition it is heavily powdery and more assertive, in accordance to the times perhaps, with a pleasing off note that manages to remind me of the impossibly chic fragrance my grandmother wore. Last, but not least, an early to mid-90s formula of parfum de toilette reveals facets of the 80s vintage but less potent, while still not as bright as the first one, but quite good. Maria warned me about the 'eau de toilette' in a broad-shouldered bottle with a green plastic cap, describing it as "just unbelievably awful. Avoid it like the plague!" Duly noted, Maria! Originally Ma Griffe was marketed as a young scent at a time when the youth segment had not been catered for. Ironically one of the most common complaints is it smells old. Myself, I ascribe that only to changed perceptions and vogues. Ma Griffe can be traced on online discounters, certain shops and on Ebay. Careful attention to packaging and bottles as well as sampling from different periods might help you find the version you prefer. I love, love, LOVE Ma Griffe. Got two vintage bottles - a perfume and an edt. Gonna wear it today. What beautiful scent it is! Yes, isn't it? I love it as well and hope to locate a nice bottle of the version I like. Enjoy your purchases and wear in good health! How informative!! I learned a couple of new things today! Ma Griffe is probably a bit old-fashioned for me, but I can appreciate the composition. I have never smelled this one and being located in the states, probably the only tester available for the sniffing is the "vile" one, still I will keep a look out for this because I am intrigued. b) the green and white striped box has diagonal folds of paper to create the pattern, sort of like origami. It doesn't smell old-fashioned in the least to my nose. As you say, it's a very Parisian rendition of a Spring day in the Fifties, but I still find it quite perky and gamine. And it's not all that impossible to find on auction sites: it must've been quite a best-seller in its heyday. this has never smelled old-fashioned to me. maybe because it's something i associate so closely with my mother - who was bombshell gorgeous (and still quite beautiful) when i was a kid. the latest edp is not nearly as bad as the edt, but it still doesn't completely capture the vintage. but then again, none of the remakes of any of these great scents does, so i'm not surprised. here's my story of ma griffe and my mom, if anyone's interested. i would say she's not the executive secretary type, then or now, more the femme fatale. though i have a feeling she would laugh at that description! You're welcome Aline, glad to provide new insights. It's like green powder, very chic. I remember the presentation with the diagonal stripes: a box of it was on the dresser of my grandmother, empty by then. She kept several boxes which varied according to the years elapsing. In a way it was interesting to watch the changes. She had the spirit of the collector and had the most lovely miniatures of parfum from old houses like Balenciaga, Carven, Balmain etc. And yes, it did sell well and continues to do so, I might add, along with their famous Vetiver. Ma Griffe IMO has the cachet of someone who has her own mind, doesn't rely on men to provide the interest in her life. Maybe that power of your -surely beautiful- mother was what made her bombshell material and so alluring. h, yes, i believe it does have that cachet - and maybe that is partly why it doesn't appeal to everyone - it has a tremendous amount of personality. and i think it's quite beautiful. but then again, i can't disconnect it from my mother. who laughed, by the way, when she saw that i associate it with her to this day. she was surprised that i remember it so vividly. your grandmere sounds like quite the woman! i can see ma griffe giving her an edge in the business world, and still making her feel very much a woman. Great review, E. As always, you've taught me a wealth of new things about an old favorite. The miracle of Ma Griffe is that it manages to be intensely green and powdery at the same time--you describe it perfectly. BTW, I have an old mini of Robe d'un Soir, and it is an incredibly beautiful, classic French composition. Another long lost treasure. I wish I could sniff the other deceased Carvens. About that "evil" Ma Griffe--the one I know personally has a dark green cap, different from the one in the link. In fact, I'm not sure I've ever seen that particular bottle. Apparently, there are an infinite number of Ma Griffes! your mother should feel a pang of pride I guess for having you recall so vividly scenes from her youth and your childhood: she obviously did things the right way! Yes, grandma was quite something! A very remarkable woman in so many ways, very durable and very giving at the same time. thank you so much: it honours me you saying so, since this is your favourite. So, another green cap...gosh, how many versions are there? Scads, probably! (I will pull the link, to protect that -unknown yet- version). Robe d'un Soir must be wonderful. I knew someone should have known it! I was given my first ever bottle of Ma Griffe eau de toilette at Christmas 1973 - I had been ill and off work for several weeks and a colleague arrived on the doorstep with a beautiful bouquet and the bottle of perfume. I have used it daily ever since. Having spoken to the guys in Paris recently, I was extremely sad to learn that the pure perfume is no longer manufactured - I miss it very much and just have to put on loads more eau de toilette, but it doesn't last on the skin like the perfume did. 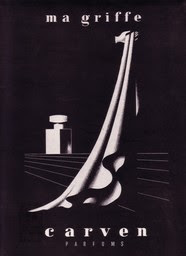 Perhaps one day the perfum will be reintroduced: I very much hope so !! Had been considering trying to get hold of this, as I remember loving it when I was young. To me, it positively reeked of long, lovely summers in the French countryside - and all the excitements and kindnesses I encountered there when I was une jeune fille en fleur (-ish!). Did you know that 'Ma Griffe' was also one of that fabulous cellist, Rostropovich's favourite perfumes? thanks for your nice words and for commenting! I still think it's among the loveliest things ever and it should probably be best if you tried to locate the time frame as accurately as possible to retrace the proper stock of Ma Griffe you love: it has changed a bit through the years, reverting and changing back, it's complicated. I have included some notes to help tracing at the bottom of the review. I had no idea Mstislav h loved this one! You mean for himself (can see it, it's pretty good on a man) or for his ladies? Great info, where does it come from, please? In the meantime, bring on the EDT and I'll bear it as best as can be. Hello again, and many thanks for your expert advice. Delighted to have it, and wish I'd discovered your blog before forking out on the new-and-greatly-disimproved 'Cabochard', which I adored as a young woman. The information was from a recent BBC4 documentary about the (wondrous!) Russian cellist. The documentary was excellent, entertaining and informative, and had plenty of material from interviews with his widow and daughters as well as friends and former students (themselves an interesting bunch, incl. Sasha Maisky). One of his students - a woman, whose name I don't recall, sadly - commented on his love of perfume, noting that MG was a favourite of his: he used it on himself unstintingly, apparently (and I have no reason to doubt the witness). Honestly, the things that stick in one's mind ...;-)! you're most welcome and thank YOU for the added info which is most impressive and indeed sticks to the mind for a long time. I will forever hence recall Ma Griffe as Mstislav's fav perfume and feel even better about it. BTW, the bottle depicted in the bottom ad of the article holds the concentration/version I like most (swirl top cap). You can still find it on discounters online. Hope to see you again on these pages! Thank you, I will certainly be following you from now on. As for MG, I'm afraid the discount version I've got is different from the one you recommend (the swirl top cap sounds familiar), and I'm, er, not exactly feeling the love for this new formulation! However, Gianfranco Ferre's Bergamotto Marino is proving a huge compensation: fabulous citrus top notes, and all manner of softer riches underneath - incl. Jasmine. Bet you've already reviewed it, tho' (will go and look). Hmmm...oh well. You might stumble upon one at another time (ebay is also good for hunting). I don't believe I had reviewed Bergamotto Marino, but should do it soon. It's summery! My grandmother had a miniature bottle of Ma Griffe which she gave to me. It has a gold, shiny swirl cap. Can anyone tell me which edition that's from? sounds like you have a 80s edition. Must be quite good (the citrus might have deteriorated a bit, but rest should be good). 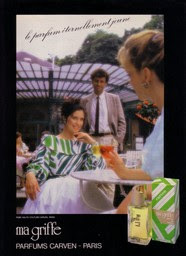 I was given a tiny bottle of perfume in the 70's and loved the citrus after-scent. I did not know that the formula was changed and now it is sharp but not so citrusy. Thankfully it was quite popular so a bottle of your preferred version is bound to crop up at some point someplace. Good luck!